How Deep Should I Plant My Irises? Boxes full of irises are arriving in the mail, and iris lovers are unpacking their purchases and trades, planning their planting schemes, or wandering about the yard wondering "where on earth will I find space for all of these new plants? What was I THINKING?" An exciting time of the year. 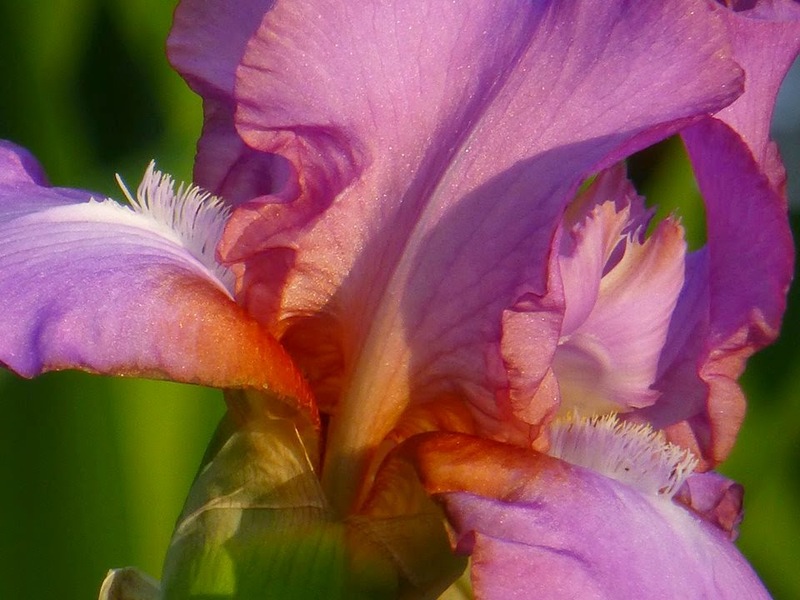 People who are new to irises are also posting questions in the iris forums and on Facebook, wondering how deep to plant them. Sometimes irises come with directions from the growers, who may be from a different part of the country, and sometimes they don't. 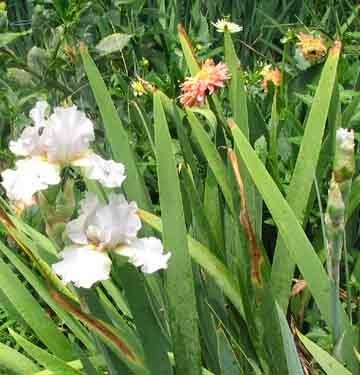 Much discussion has resulted on some of these iris forums, with many of us repeating the advice we heard from our grandmothers: that irises should be planted with the top of the rhizomes exposed. I admit to dispensing this very advice myself until last year, when I learned from professional growers that the ideal planting depth does not always leave the top of the rhizome exposed, and that indeed, the rhizome should be covered by as much as two inches of soil, dependent upon the climate. 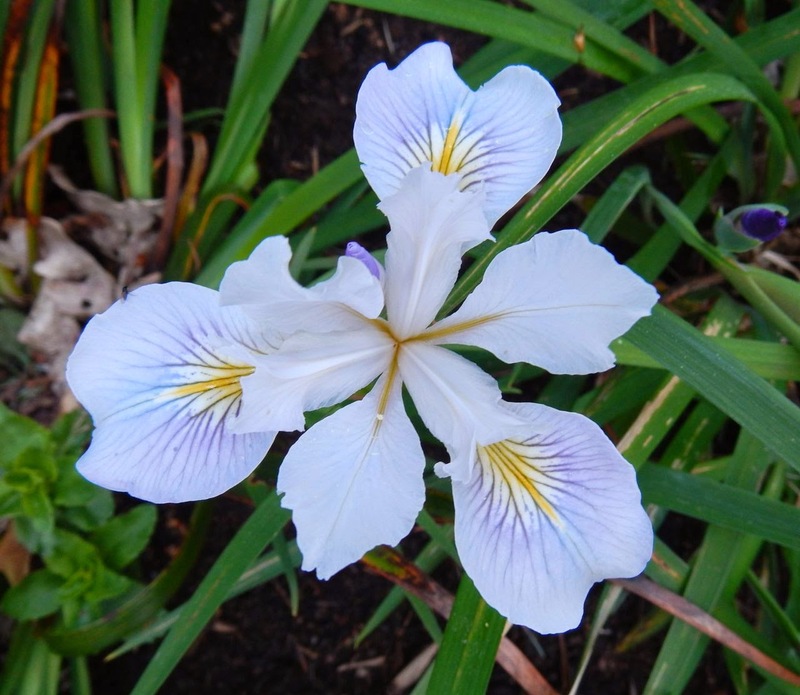 The American Iris Society website says to plant rhizomes "at or just barely below the surface of the ground. Irises should be planted so the tops of the rhizomes are visible and the roots are spread out facing downwards in the soil. However, in exremely hot climates or with very light soils, cover rhizomes with up to one inch of soil." So the first thing we learn is that iris rhizomes should be protected from the sun and heat in hot climates. In Cathey's Valley, California, Rick Tasco and Roger Duncan of Superstition Iris Gardens plant their irises with about an inch or so of soil over the rhizome to protect them from the hot California sun. Iris rhizome under 1" of soil at Superstition Iris Gardens, California. 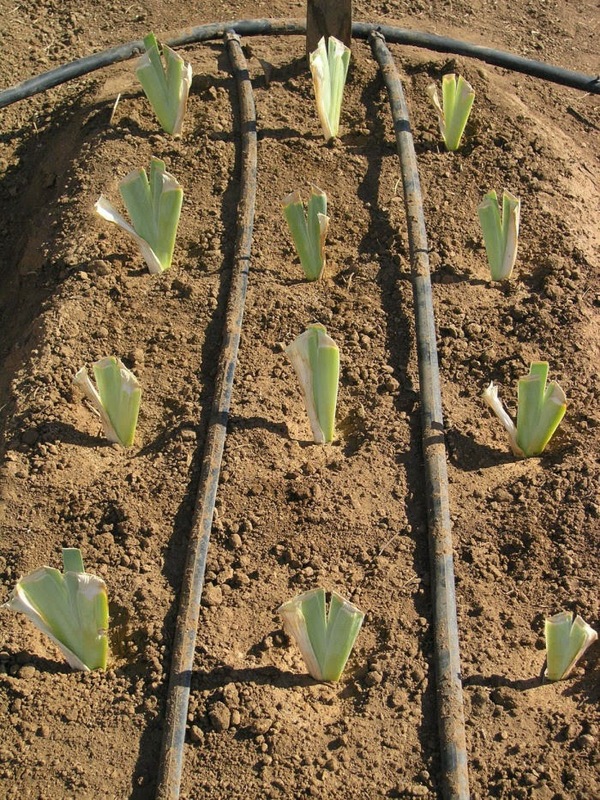 Iris rhizomes at the proper depth for hot sunny climates. The advice to protect the rhizome from the sun is also recommended in areas we would not normally consider too hot and sunny, such as Colorado. 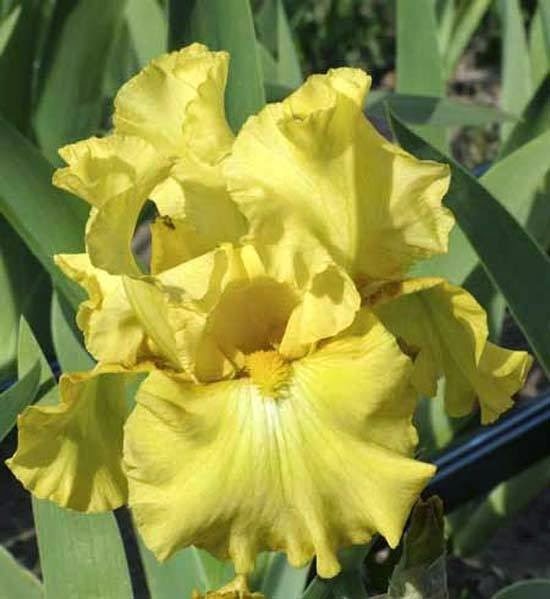 Iris hybridizer and grower Bob Van Liere of Iris4U says "in Colorado it is recommended to plant just below soil level to keep the rhizome from sunburning. We are at 5300 feet here at our garden and most of the Colorado is above 5280 ft. We have customers planting up to about 9200 feet, a short growing season for sure." So summer sun is something to consider when planting in high altitudes as well as the typically hot climates of places like Arizona and Southern California. 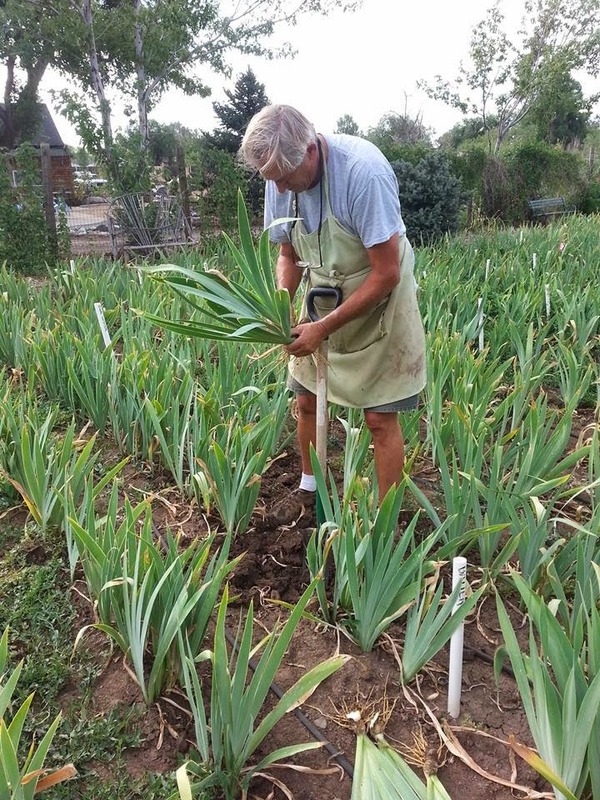 Bob digging irises at Iris4U in Colorado. Note the depth of the rhizomes. 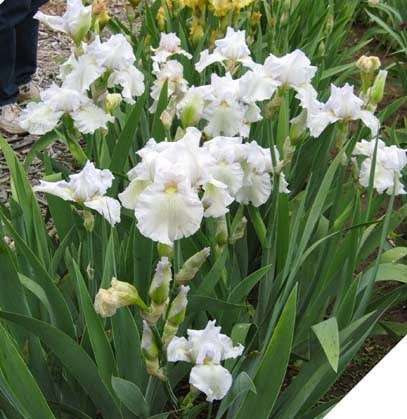 Hybridizers who grow irises in very cold conditions also recommend deep planting for iris rhizomes. Chuck Chapman, a hybridizer in Ontario, Canada, experimented with planting depth several years ago, planting rhizomes half exposed, with only the top of the rhizome exposed, and a half inch, one inch, and two inches beneath the soil. He says they all bloomed and increased, but the best growers, by a small margin, were 1/2" and 1" beneath the soil. The worst growing rhizomes were half exposed. 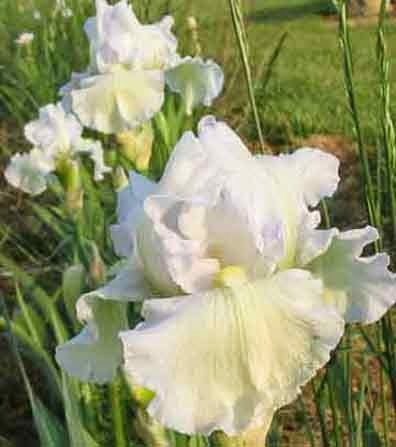 Chuck is probably the most northern grower of tall bearded irises, and he notes that there is less frost heave the deeper the rhizomes are planted. Furthermore, he says that when he contacted other growers about how they planted their irises, all planted them below the surface. As a final note, Chuck points out that Bob Van Liere did some research on roots, and the results of his experiments were published in Tall Talk, the periodical of the Tall Bearded Iris Society. He planted rhizomes with and without roots, and those with roots did substantially better than those without, growing "hair roots" off of the trimmed roots. Some people like the longer roots because they hold the iris up and in the ground as it gets established. 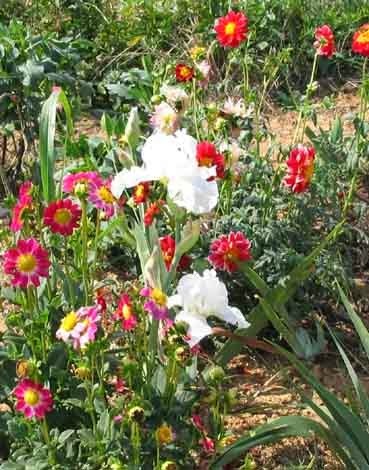 I have mixed plantings in my hot Southern California garden, and everything else needs more water than the irises. That translates into problems with rot, especially since my soil is rich and loaded with organic material that stays wet. Hot plus wet equals fungus and bacteria growth. I lose a significant number of irises some years, particularly in small beds bordered by bricks or stone, which turn into little dutch ovens during the summer. One trick I use to increase drainage in my mixed beds is to plant them in mounds. I place the rhizome on a mound of soil at the same level as the surrounding earth. I cover the roots well and the rhizome by just a bit, producing a low mound above the surrounding soil level, to provide better drainage. Since iris growers won't be able to put food on the table unless they are successful at what they do, I tend to favor their advice, rather than what grandma told me. So I now plant my iris rhizomes a bit deeper. Whatever you do, though, do not plant them deep like a flower bulb! They are not bulbs, and if the green leaves are buried they will not thrive and may die. If you are not sure about how deep you should plant your irises in your particular climate, your local iris society may have some advice. Check here to locate a society near you. 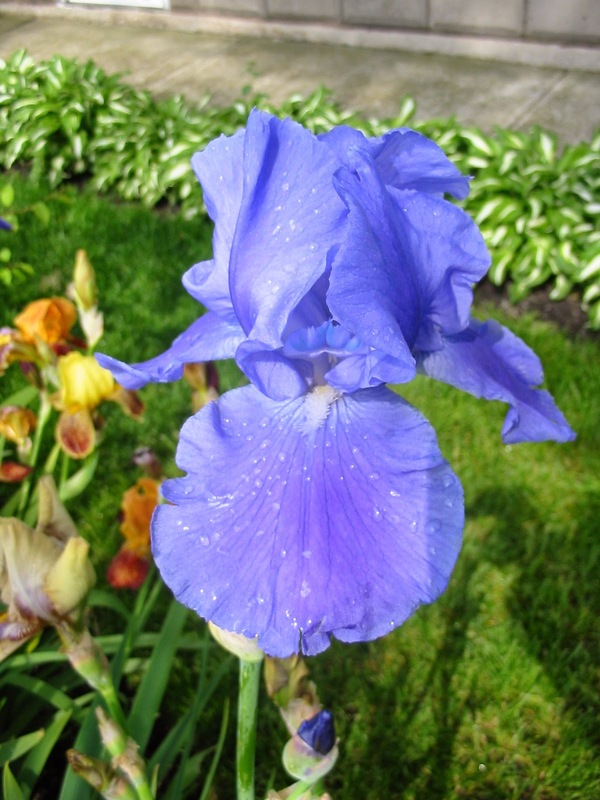 And if you have a favorite tip for planting irises, please share it in the comment section below. And good luck finding spots for those incoming orders! Creating New Irises Can Be Frustrating! Don't Give up!! Twenty four registered irises have 'Immortality' in their lineages. Most of these indicate that 'Immortality' is the pod parent. This is because its anthers are rarely able to release pollen. My personal experience is that crosses with 'Immortality' as the pod parent are mainly undesirable. In other words, these often wind up on the compost heaps. It takes a lot of seedlings to get a good one. Dr. Zurbrigg, the hybridizer of 'Immortality', was quite helpful to other hybridizers. He wrote articles in 'The Recorder' and was good about answering questions. He and I were on a rebloom robin a few years before his death, and he addressed 'Immortality's' pollen problem. Most people find that the anthers look dried up and useless and most seasons the pollen is useless. Dr. Zurbrigg pointed out that some years the anthers make the pollen but simply do not release it. If you wait until the anther is mature, you can put it on something like a paper plate and press the blade of a kitchen knife on the anther. As you pull it across, a few grains of pollen will release. During the time I was using 'Imnmortality,' it happened only twice. It is well worth the effort, since the children produced from these crosses seem superior to the reverse! 'Immortality' makes a beautiful companion plant when planted with colorful blooms. Like most rebloomers, it needs to be moved every couple of years to rebloom well. The clump above was planted during the summer of 2004 and the picture was taken the following summer. During my third year of making rebloom crosses, I was able to strip some 'Immortality' anthers and obtain good pollen. Both 'Bridge in Time' and 'Returning Chameleon' were introduced from this process. I made over a dozen crosses using 'Immortality' as the pod parent. 'Corn Harvest' and 'Champagne Elegance' as parents each produced several rebloomers, but all found themselves on the compost pile. During the spring of 2013, I took two of my granddaughters to what turned out to be the last SOKY show. They enjoyed touring the display garden. They used my digital camera to took many clump shots in the garden. This is their picture of 'Bridge in Time.' It is much taller than 'Immortality' and has had 13 buds. Although I considered it to be less attractive than 'Bridge in Time,' 'Returning Chameleon' turned out to be the most dependable rebloomer. Even if it's left in the same spot for years, it will rebloom well if fertilized and watered.. The ruffling is less obvious when blooming in the heat of summer, but it does rebloom. Fall blooms often open in cooler weather and their features, like ruffles, are more distinct. 'Returning Chameleon' has become a favorite through the years. One Halloween, I was taking pictures of 'Returning Chameleon' when Jack jumped right in! He's a stinker, but really good contrast for 'RC. In closing, 'Immortality' is thirty two years old and most would say it's too old.to use in breeding. In an area where only a few rebloomers perform, it is still one of the most dependable. My goal is dependable rebloom in zone 6b. Would I use it again? Yes. Under the right conditions, and if I could get pollen. 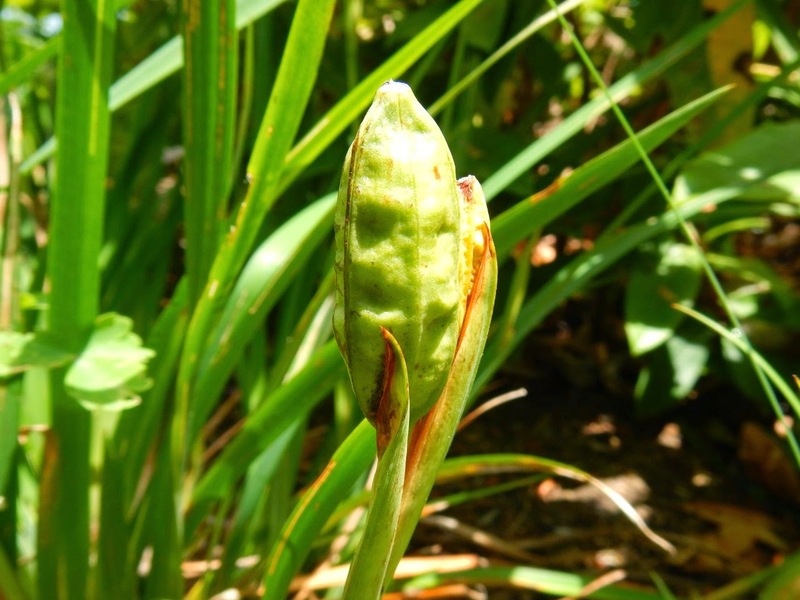 All irises have pods with three valves that open and spread when seeds are mature and pods are dry. Open pods toss seeds a few feet, shaking seeds out in the wind and opening a bit more from day to day. Iris pods often open at inconvenient times, usually on hot sunny days when I'm away from home. This was a frustrating reality for me when I started crossing plants and saving seeds, because I'm often hiking in mid summer, away in the hills when those pods pop open. I. douglasiana has green pods with three valves. Bag and save upright pods, not the sprawling stems. You will find the mature pods more easily later if they are upright. 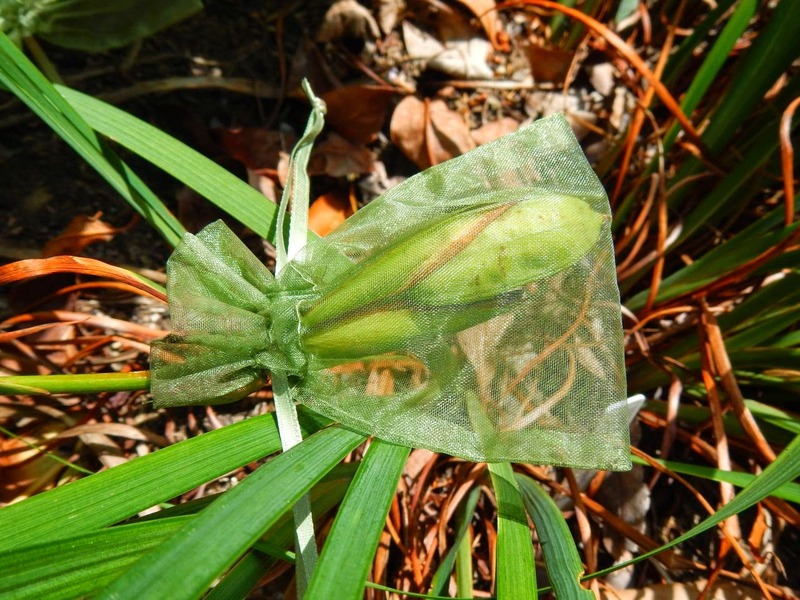 I began collecting iris seed by designating small paper bags for each variety, adding pods to the bags day by day and week by week, cutting off the pods when the color started to change from green to brown. But inevitably, some slip past, and open on their own. Tracking seeds of choice hybrids was tough: several times the pod opened and seeds slipped out, and were scattered in the garden in less than 24 hours. When you’ve hand pollinated the flowers after growing the parent plants, losing the seeds at ripe pod stage is tough. Iris douglasiana has the longest ripening period. Pods may take nine weeks to fully mature. Iris douglasiana is the most widely grown Pacifica Iris, and its pods are ripe about nine weeks after flowering. Some species ripen a bit earlier, like Iris innominata, which has lovely yellow flowers; in five to six weeks the seeds are mature and ready to gather from this species. I learned this the hard way, going out weeks too late to bag what I thought were green pods and finding only the pod sections, brown, dry and open with the seeds long gone. Iris innominata can ripen seeds in five to six weeks. I know, because I lost all the seeds the first year this species flowered in my garden. I sauntered out in week six to put pod bags on the three green pods, only to find they were brown, open, and the seeds were scattered. There is a solution: organza party bags, AKA seed pod bags. These days I check plants a few weeks after flowering, cut off flower stems on plants whose seeds I do not plan to save, and put mesh bags over the rest. For my original purchase, I got green bags, thinking green would blend in better over the summer. Not bad, but I now find bags all winter, even in spring, that were overlooked the prior summer! Mesh bag on green pod––unobtrusive, discrete, and could be easily overlooked in a few weeks when the seeds are ripe. When the pods are ripe, I cut the stems off, tie them together, label the bunch, and dry the pods still in the bags. If they open and shed seed, great, this saves me time prying open each pod. If they don't––and some late flowering I. douglasiana plants often do not open their pods––I slice each pod open along one side and pry out the seeds. If the seeds are going to a seed exchange, they go back into a clean mesh bag, labeled, and air dry for a couple of weeks. If I keep seeds to plant, I plant them immediately outside. The goal: New seedlings. Note the styrofoam boxes, top layer of chicken grit, and mesh cover. The grit helps in heavy rain to keep the soil mix in place. The mesh wards off any number of animals and birds that think germinating Pacifica Iris seeds are tasty snacks. These seedlings will go out into the ground in early fall. I live in a summer dry, winter wet climate, which Pacifica Iris prefer. Seeds go into styrofoam boxes, in a well drained mix, covered with a thin layer of fine granite gravel (chicken scratch). 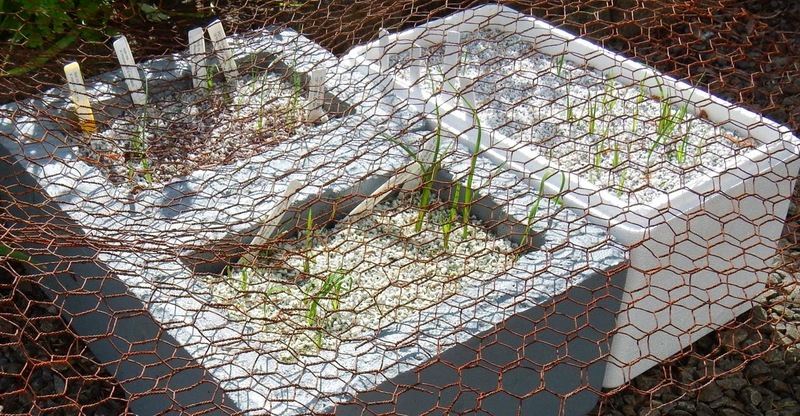 A fine wire mesh cover goes over the top, to keep voles, chipmunks, jays, crows and other animals from eating germinating seeds. The seed boxes stay outside all winter, no matter the weather, and in the spring the next crop of Pacifica Iris seedlings emerge. I'd like to know what other iris growers think of using mesh bags, and what color of bag you recommend. I need to order more. I’m thinking red or orange for the next order. Or should I go wild and order mesh bags to match the pod parent flowers? Iris anguifuga - The missing link? 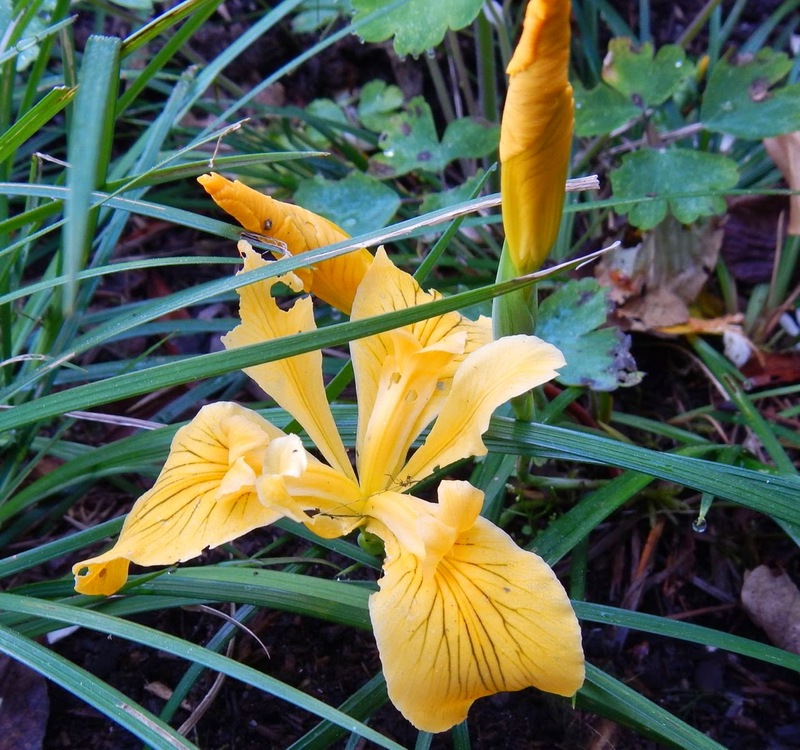 Iris anguifuga is native to China and has been cultivated for centuries around summer gardens to repel snakes from entering the grounds and, when the rhizome is ground into a paste, applied topically as an herbal remedy against snakebites (or so these ‘Old Wives' tales go). This clone was collected by Dr. James Waddick in 1989 and has been named 'Snake Bane'. 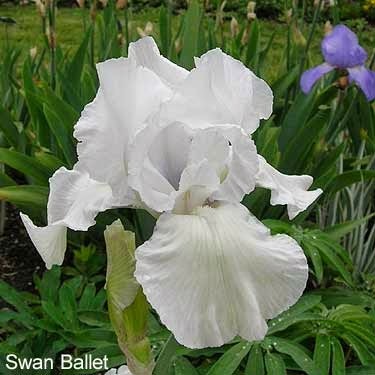 'Snake Bane' is a typical beardless Iris in many respects. 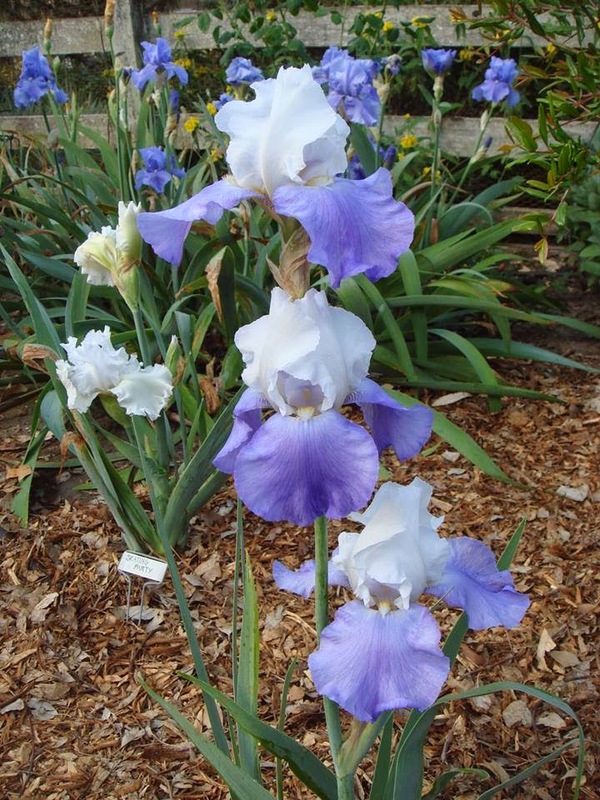 It has that generic shape and color of many irises. It could easily be mistaken for a Spuria Iris at bloom time. 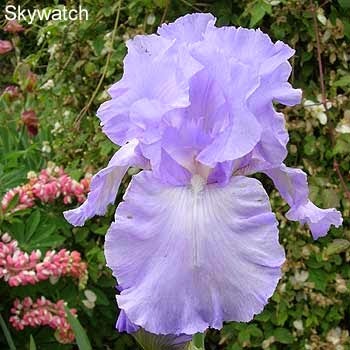 However, it has a marked difference from all other irises, it is dormant and leafless during most of the growing season. Iris anguifuga begins growth in late fall as other irises are getting ready for winter and the snakes are going into hiding. It remains green in my z6a garden all winter although at only two to three inches in height. In early spring it puts forth a burst of growth and is in flower by mid-May. 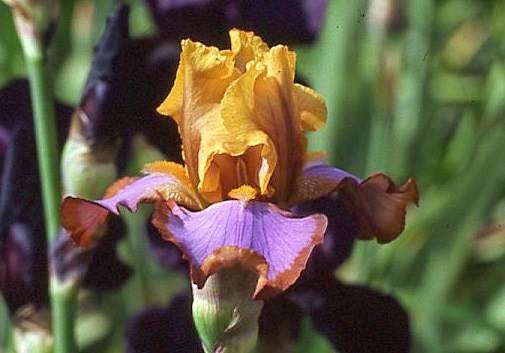 Around June, as the snakes emerge and gain their strength back, the Iris goes dormant or 'disappears'. These two older photos give a better idea of the true color. I. anguifuga is vigorous in full sun and makes a nice clump quickly. 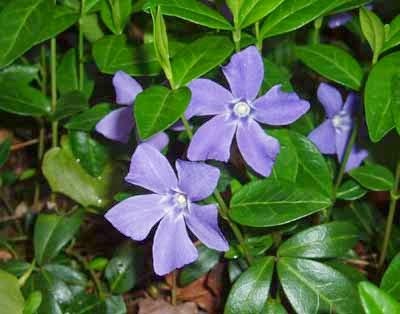 It will grow in partial shade but flowering will be reduced. The missing link? Iris anguifuga spends summer as a compact bulb. When it breaks dormancy in the fall it grows a rhizome. 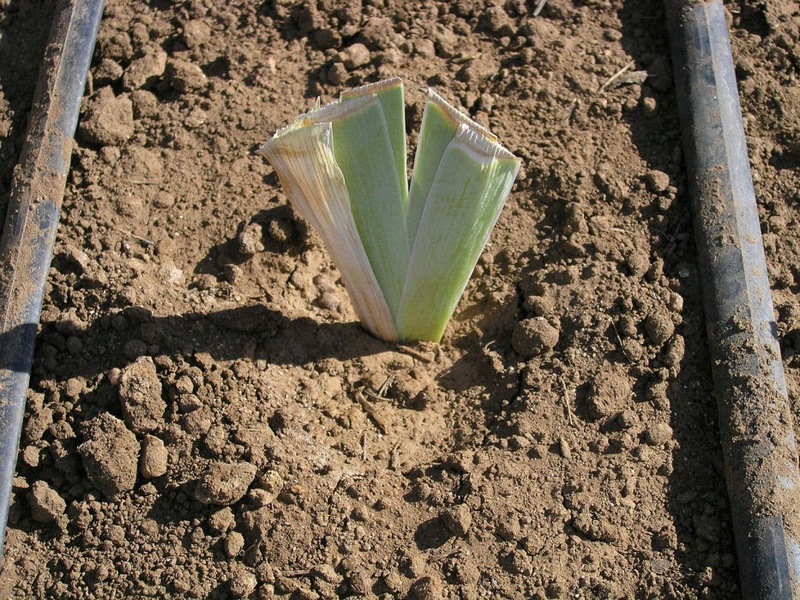 After flowering the rhizome withers away except for the growth point which pulls together in the form of a bulb. It is thought that this may be how bulbous irises first developed. 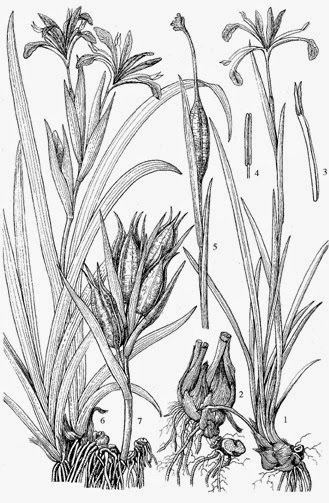 This illustration from the book Iris of China shows Iris anguifuga on the right half, 1 through 5. You can see the bulb shape has formed just before the rhizome will disappear for the summer. It is a modest plant in the garden with a simple display, but the story is a real conversation starter and who knows? Maybe it will keep the snakes away, too. My focus this time will still be on the "Oldies" before 1985 but I will focus on those 'historic' irises that won the Dykes Medal. Our iris patch in peak bloom. Dykes Memorial Medal: First awarded in 1927, The Dykes Medal is the highest award of the AIS. Awarded to no more than one iris per year, Irises are eligible as a Dykes Medal candidate for three years following the winning of a classification medal. Only AIS registered judges may vote. Medals: Each year there are medals awarded to irises of each specific classification type. This is the top award for each AIS iris classification type. 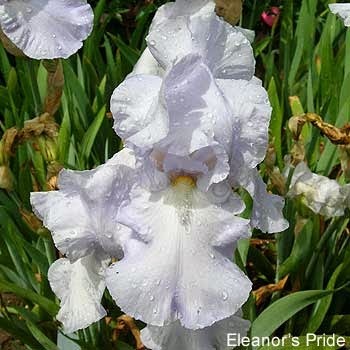 Irises are eligible as a candidate for a medal the second year after they receive an Award of Merit (AM), One medal for each classification is given each year (except for the very popular tall bearded which awards 3 Wister Medals each year). Some years no award was given. Those years were 1930, 1931, 1934, 1946, 1960, 1969, 1987, and 1985. Once an iris is eligible it is only eligible for 3 years and then is no longer eligible. It can take 17 to 21 years before an iris is eligible. Here are the "historic" irises that won the Dykes Medal between 1958 and 1984. 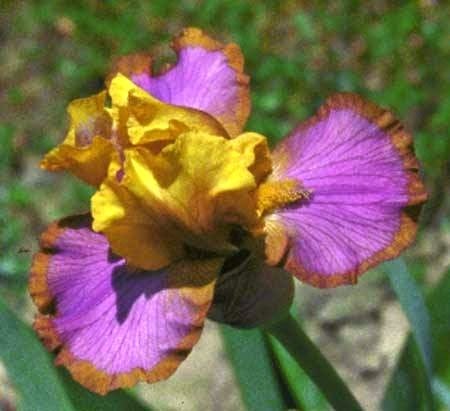 This iris was introduced in 1953. It is a blue self with a light silvery color. Described as violet, ultra-marine, frosty blue. Photographs close to true color. Very tall in our garden. 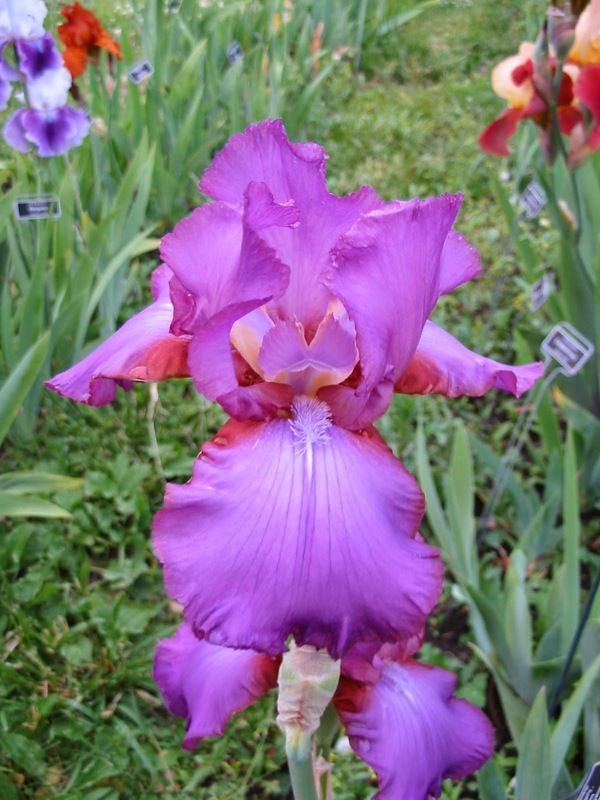 This iris is a favorite of mine because of the ruffles and flutes. I like the contrasting beard as well. It really was ahead of its time for form, created nearly 50 years ago. This is one of the first of all my irises. I received it in a trade from a friend back in 1985. Rather simple looking, but white shows so nicely in an evening garden. I thought that I was going to get rid of it because it was too simple (no ruffles or lace or flounces) but I think I will have to reevaluate that decision. A few years ago I told my husband that it had to go and he transplanted it to a part of the orchard where I rarely go. I think that it is time to bring it back. This iris still wins awards today. It has form, texture, contrast, substance and more. Lovely in a vase with yellows and whites and deeper purples. 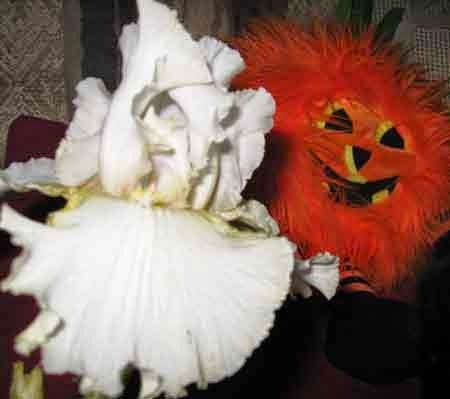 Forty-five years old and many iris growers still include it in their catalogs. Not the best picture because it was taken indoors. Among its attributes are vigorous habit and heavy substance. 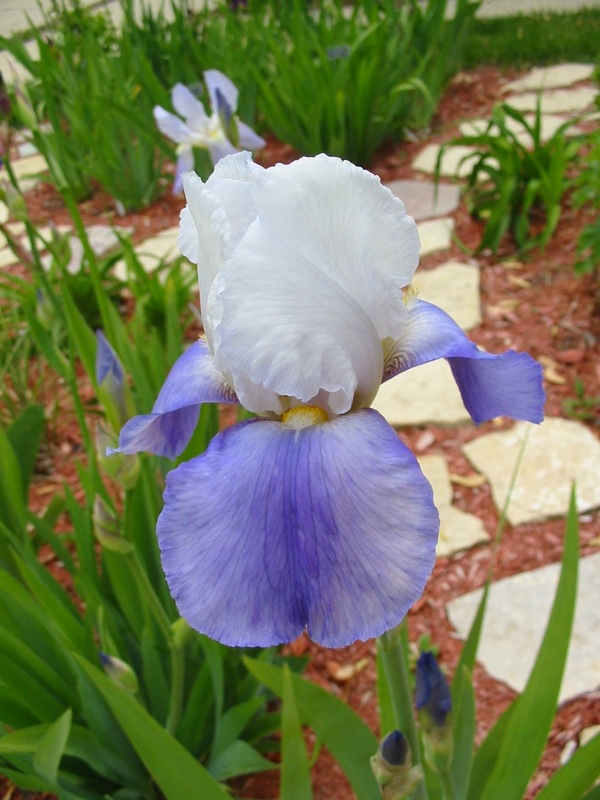 This iris is described as a remarkable French blue. It stands out in my garden. It has veining which enhances the iris. A massive medium blue flower that takes little care but stands out in a crowd. This is one of my favorite pinks. One note however, it won't look right in a pink depression glass vase because it has too much shrimp color in it. This ruffled and frilled plicata cries out for attention. The first plicata to win the Dykes since 'San Francisco' in 1927. Plicatas are those irises that are stitched or stippled with a margin of color on white or dots or peppering. I'm always attracted to lavendars, orchids, and purples. This iris reminds me of periwinkle- that pretty little blue/purple flower that is a ground cover. Picture below. It has clean coloring which I love. This one has a lovely precise 1/8 inch gold border around the falls, which unfortunately doesn't show well in this photo. I spelled this wrong for years (Francis). This grows vigorously for us and is a lovely pastel. The graceful ruffling is beautiful. This bitone (two shades of the same color) is said to be well liked by Californians (me too). I tend to gravitate to blues and pinks. This one is a lovely delicate pink without any shrimp color in it. I'm afraid this one doesn't increase well for us but the form and color is worth keeping anyway. Susanne Spicker describes the falls that are wide and full as "cocker spaniel ears". We like the generous falls on this one a lot. This one is very stunning with only one fault that I know of. The stems are rather thin and in a wind storm they fall. It made a beautiful clump for us this year. Do you grow any Dykes Medal winners? Do you plant them all together in the garden or do you put them with other irises? Which ones are your favorites? I am very grateful to all my friends who so generously shared their photos. They shared more photos than I had room for, so I will do a continuation of this article in the future.